Christopher Kelly is the General Studies Instructor of MA and HIT programs at YTI. 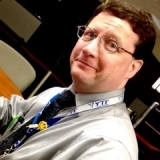 He is a cross-cultural educator, instructional designer and program director with broad background developing teaching materials, enhancing performance and efficiency of existing systems, interdepartmental relations, report design, data analysis, technical writing and training adults in both corporate and educational settings. He also specializes in daily lesson development, content creation and classroom instruction of adults in a variety of soft skills and professional coursework. Courses taught include mathematics, psychology, professional development, critical thinking, communications, and computer skills - including the Microsoft Office suite applications: Word, Excel, PowerPoint, Outlook, and Access. Chris is very knowledgeable with computer programs. He received his Masters Degree in Instructional Design from Full Sail University in 2015. Chris is very good at building and creating reports and also training others how to use them. He believes he would be an asset to any company.